Isn’t this beautiful? The craftsmanship is amazing, and made by the loving hands of a talented Tongan woman, a member of a women’s handicrafts co-op. My sweet and wonderful sister-in-law, Inga, was born and raised in the Kingdom of Tonga in the South Pacific and is now an American citizen. She recently returned to Tonga to visit her mother and to check out the devastation from a recent cyclone. While there, Inga went to the co-op store and bought this cup for me, along with a stunning hand-carved platter for my daughter Kristina, hand-woven and painted placemats and coasters for my daughter Kara, and a hand-woven handbag for my mom. I wish I had taken pictures of those! Inga presented them to us last weekend in California while we were there for Kara’s bridal shower. 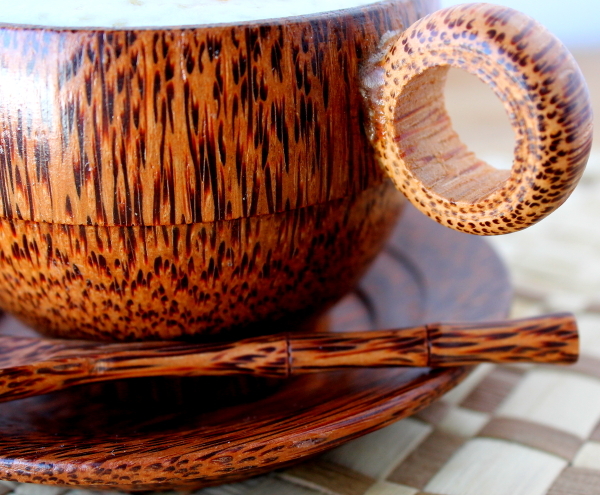 Since it is a coconut tea set, I decided to put something made with coconut in the cup. My husband is crazy for tapioca pudding, so I wanted to see if coconut milk would work. It was great! I added a little toasted coconut for a topping. Tapioca, as we know it in the box as Minute Tapioca, is not available in Tonga. My brother Paul, Inga’s husband, made some tapioca pudding one time for Inga and their three precious girls. There is no Tongan word for tapioca pudding, so the girls named it “Palangi Pudding.” The word palangi comes from an ancient Tongan legend. This ancient legend is about the gods descending to earth as huge billowing white clouds. When the first European sailing ships were sighted by the Tongans, they thought that the sails were clouds coming from Tongan heaven, called Papalangi. When the gods turned out to be mere mortals, they were called palangi, people from Papalangi. A palangi now refers to anyone who is basically European or caucasian. Palangi is also the name for the English language, which was taught to them by English missionaries. So call it Palangi Pudding or Coconut Pudding; either way it is delicious! Crack the egg into a medium saucepan and whisk until well-beaten. Add the sugar and tapioca. Shake the can of coconut milk well, then pour into a 3 or 4 cup liquid glass measuring cup. Add enough milk to make a total of 2-3/4 cups liquid. (see note below). Add the milk to the saucepan and stir well. Let mixture stand for 5 minutes. Cook over medium heat, stirring constantly, until mixture comes to a full boil. Remove from heat and stir in vanilla. Let cool for 20 minutes and stir again. 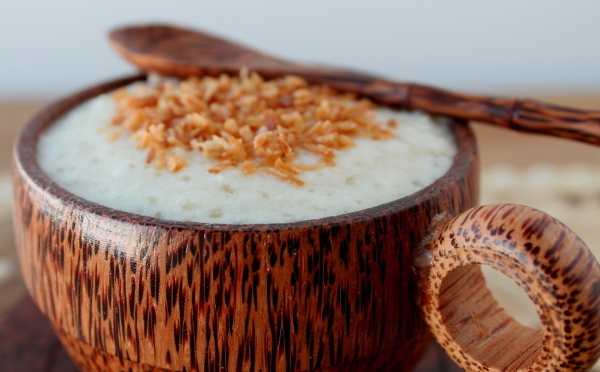 Serve warm or chilled, topped with some toasted coconut. Makes 6 (1/2 cup) servings. *Be sure and buy coconut milk, not cream of coconut or coconut water. Coconut milk can come in various sizes, but most are about 13 ounces. Whichever brand you use, if it’s a little more or less than 13.5 ounces, just be sure to add enough milk to make 2-3/4 cups. 8 Responses to (Coco)Nuts About My New Cup! Lisa, the cup set now has a special place in the culinary cellar and my heart! 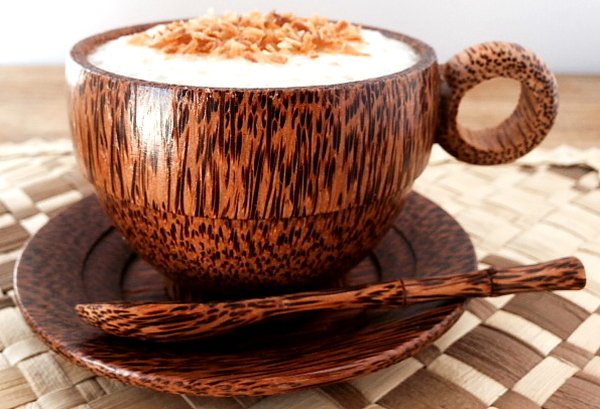 What a creative and delicious way to use your lovely new coconut tea set. I am looking forward to trying your recipe, but I don’t know if my ‘Palangi Pudding’ will taste quite as sweet without the coconut cup from Tonga! Special gifts somehow do make our recipes taste a little bit sweeter!! Thanks for sharing. Thanks, Kim. My coconut cup is now among my favorite things. Thanks, Angela! I adore it, too! What a beautiful cup – and a marvelous story.